Despite the high-falutin’ title, this is not a complete guide nor is it compiled by a pro. It’s more of an introduction by someone who has made all the mistakes possible and, hopefully, learnt a thing or two in the process which I now try to pass on. As amateur volcanophiles, we are limited to the information we can scrounge from open sources on the internet, each with its own risks of misinterpretation and set of limitations. Webcams when working give us a picture of the now but are relatively useless as a tool for prediction. Earthquakes can be very misleading, even when a seismologist has evaluated each registered quake. Not only does this not tell you the nature of the quake, you also have to have an intimate knowledge of the system in question in order to accurately assess its importance and what it might portend. One of the better ways for us volcanophiles to get an idea of what, if anything, is going on is to look at tremor. Even so, there’s a lot you have to be aware of before you can draw any conclusions from such charts. 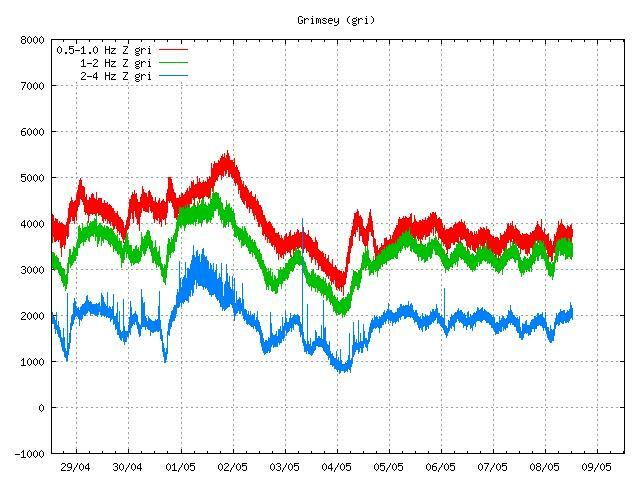 Grimsey is a small island located north of Iceland, about 50 km offshore, and you’d expect wind, waves and tides to show up in the tremor chart as they indeed do. To the right, you can see that from May 5th, there are peaks twice daily and if you check with the chart for tides, you’ll see that the peaks coincide with the time for high tide and the troughs with the time for low tides. The reason we cannot see this during the period April 29th to May 4th is twofold. First, we had a Full Moon on the 6th which results in much higher tides, spring tide, whereas the Moon was in the First Quarter on April 29th, which results in much lower tides, a so-called neap tide. 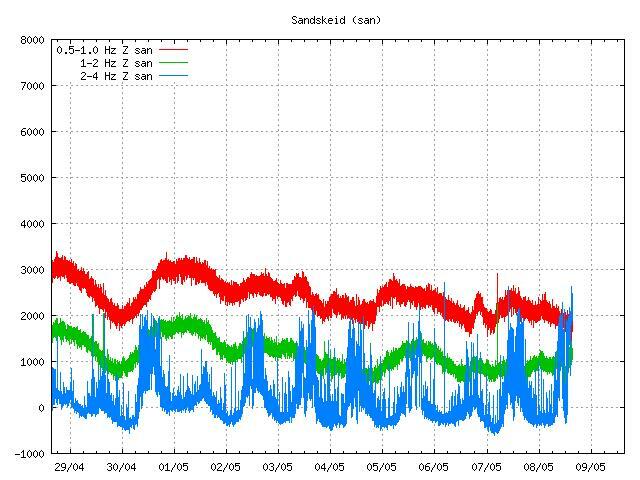 Second, with a spring tide of about 4 meters and neap tide at 2 meters, it’s easy to see that if you have bad weather such as you had in the area prior to May 3rd, wind and waves will tend to drown out the tremor pattern induced by the tide. The third phenomenon visible in fig.1 is earthquakes. They show up in the tremor graph as thin, vertical lines predominantly in the blue, the taller the spike, the greater the intensity as experienced at the SIL-station. Most of these quakes are local and are too small to have shown up on the IMO earthquake maps. 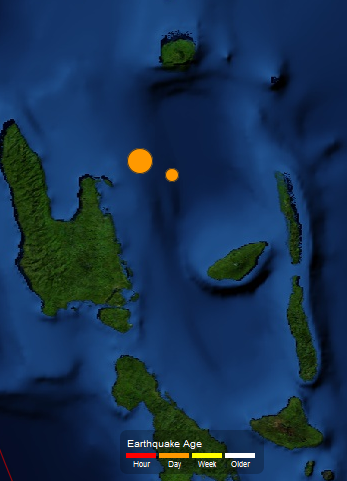 However, if a quake is powerful enough, it will show up despite being at a great distance from the SIL-station. As an example, the March 11th 2011 quake off Japan was powerful enough to be picked up all over the planet. Another factor to be wary of is location. If the SIL-station is close to an area of human activity, this will be picked up and displayed. The tell-tale to look for is periodicity. Here I have marked the Sandskeid SIL-station in purple and gold. Please note the location a scant 10 km from Reykjavik, almost on the main road leading out of Reykjavik to Southern Iceland, thus in an area where a lot of traffic, and in particular heavy traffic, passes through. The tell-tale here is periodicity. April 30th was a Monday. May 1st, a Tuesday, was a national holiday. Other than that, it’s easy to see that on weekdays, Icelanders start work around 08 am and finish at 5 pm. From the dip around mid-day, you can see that they take their lunch break between 12 am and 01 pm. You can also see the influence of weather on human activity. From our look at Grimsey, we already know that the weather was not good before May 3rd or so but very nice over the next weekend in particular. The chart shows that people mostly stayed at home over the weekend April 29th – 30th plus May 1st when weather was iffy, but last weekend the nice weather must have almost emptied Reykjavik to judge by the traffic. As can be clearly seen, in this case human activity shows up on the tremor chart to such an extent that it almost certainly masks everything but the heaviest of weather and earthquakes in the blue or 2 – 4 Hz part of the tremor chart. Reynihlid SIL station is located close to Krafla Power Station in the Myvatn area, North-East Iceland. Even if the SIL-station is picking up some naturally caused tremor here, it still shows the tremor induced by the geothermal power plant beautifully. Again, you can see that human need for electric power follows the weekly and daily pattern of human activity with the added bonus that you can tell that most Icelanders go to bed at about 10 pm on weekdays when the demand for power suddenly drops. Quite a well-regulated people, wouldn’t you say! Fig 5. Activity at Herðubreið observed at Dyngjufjall SIL-station. 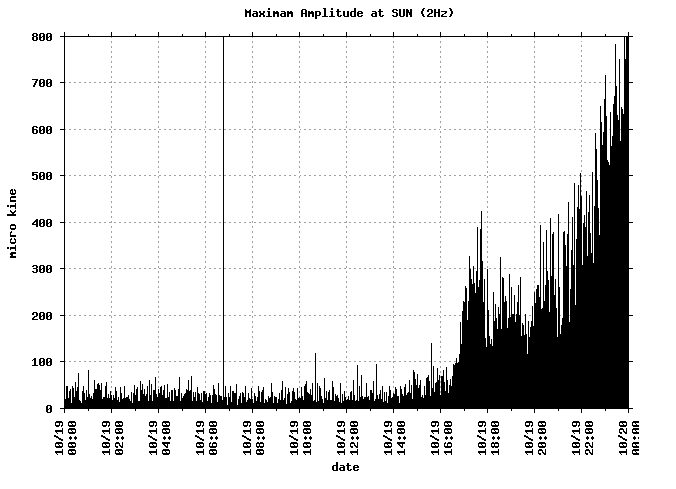 The 3.4 magnitude quake that started the episode is clearly visible as the big spike at midday on May 14th. 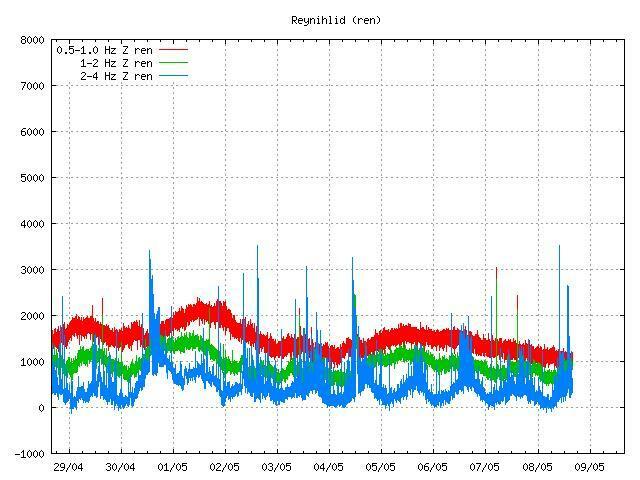 The sharp increase in the 2 – 4 Hz blue tremor band on the 13th was caused by the storm that hit Iceland on May 13th to 14th. 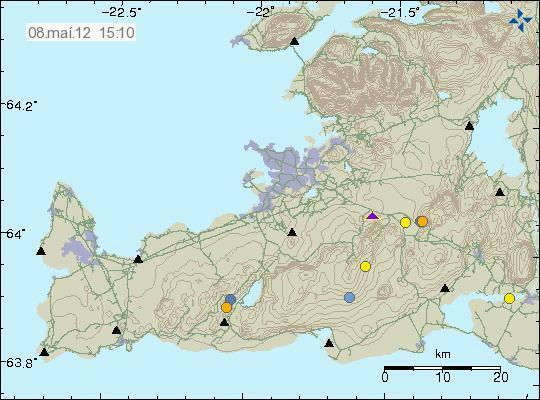 At noon on May 14th, a magnitude 3.4 earthquake signalled the beginning of a period of seismic unrest at Herðubreið that included well over 120 earthquakes. These are easily visible in the tremor chart, but as can be seen, there was a lot of similarly looking and just as frequent if not equally intense activity prior to that. There are no corresponding earthquakes registered to explain them, so what are they? A human origin seems to be ruled out as there is no periodicity, nor is the SIL-station located in an area where tremor-inducing human activities occur. Some of them, the smallest and most insignificant peaks, may be local microseismic earthquakes, far too weak to register on the IMO network. Single boulders, freed from ice, tumbling down a mountainside might generate such a signal if they bounced on rock but such an intense and long-lasting event is not very likely. They may also be hydrothermal in origin as superheated water, i.e. water far above the boiling point of 100C but kept liquid by the high pressure several hundred meters to a few kilometres below the surface. The most likely explanation is a combination of ongoing hydrothermal activity with microseismic activity as a minor component. I’ll leave you with two SIL-charts to ponder. Vatnsfell is located as close to equidistant from the four major Icelandic glaciers and thus most of its main volcanoes in an area where few live. The area is also known as the “Dead Zone” and is where the last three of Iceland’s major rift eruptions occurred – Eldgjá in 934, Veidivötn in 1477 and Laki or the “Skaftár Fires” in 1783. The first is the Vatnsfell tremor chart from May 2011, leading up to and including the initial eruption of Grímsfjall on May 21st. Note that when there is an eruption, it shows up distinctly and unmistakably on the tremor chart. 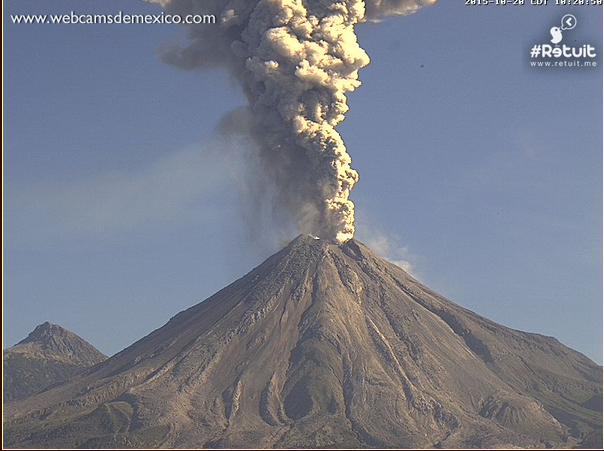 If you think you can spot an eruption on one of the many webcams, it is a very good idea to check relevant SIL-stations in order to see that they tell the same story! 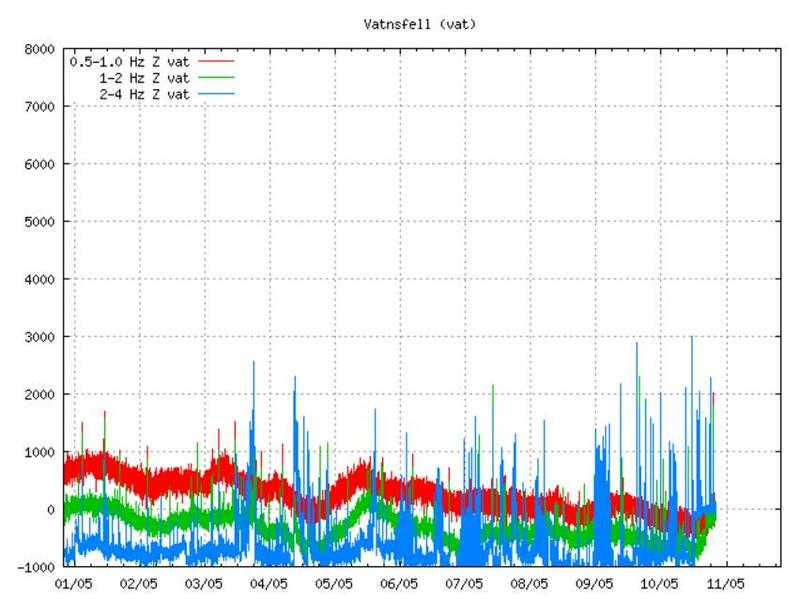 The second is the Vatnsfell tremor chart on May 11th 2012. As can be seen, there is little if anything to suggest human activity here as tremor does not follow any sort of periodicity. 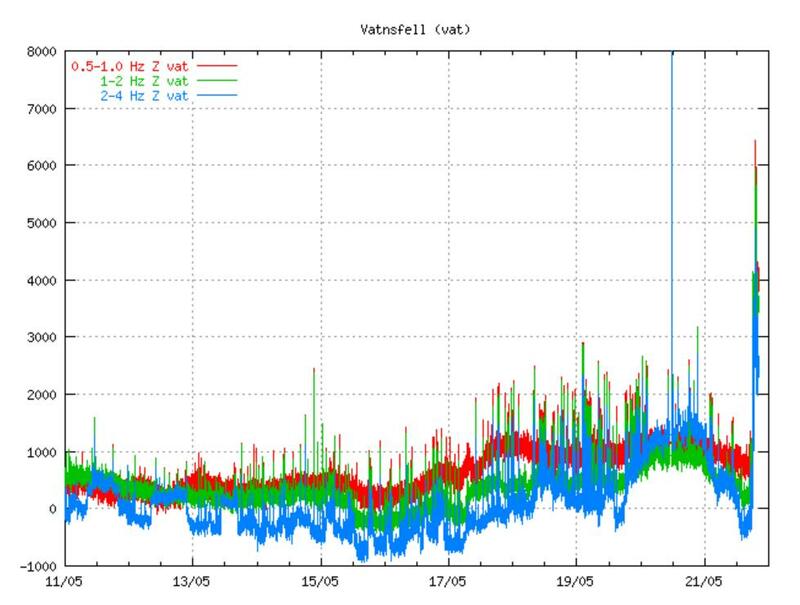 It has been suggested that the tremor may have been caused by the hydro-electric plant at Lake Thorisvatn (Þórisvatn) opening the gates to let out excess water, but Carl has checked it and found no evidence that this could be the case. Thus, it is almost certain that the tremor visible in the chart is natural in origin, but in order to determine its exact nature, expert knowledge is required. Agreed. The only thing I could add is that lower frequency sounds tend to be associated with larger vibrating structures. In fact, this post almost made me go set up my accelerometer to grab a good example of passing traffic. I have been wanting to get it up and running overnight so I could catch the vibrations from the passing freight train that rolls out of here in the early AM, just to get a good sample of it’s tremor. Well. when I was in my old office in Coos Bay, Or. in front. this was in a concrete building on its own slab.-On fill form bay dredging like most of downtown.. The speed of sound in air is 340 m/s at 20C (varies with temperature). In water it’s 1,433 m/s and in granite 5,950 m.
If I recall my high-school physics correctly, the smallest possible structure that can be made to vibrate/resonate is ½ the wavelength (lambda) so a structure that resonates at 4 Hz (four complete oscillations per second) in air would be (340 / 4) x ½ = 42.5 m. Looking at a granite slab that resonates at 0.5 Hz, it works out at 5,950 m.
No wonder you need a PhD Physics and the patience of a saint in order to be a seismologist! Just an idea, but one of the more popular vertical antennas is the 5/8 wave antenna. It tends to produce a squashed doghnut pattern that gives you better power levels along the horizon. No clue if that idea can be used here. I guess that what I am getting at, is that if you have more than one seismo that is picking up the tremor, it’s quite possible that you could discern which stations are in the main radiating field based on the relative strength of the tremor detected… if the source is behaving as a mechanical resonant structure. Caveat: Not a physicist, seismologist, volcanologist. Just some half crazy retired Electronics Warfare technician with a wild arsed idea. ahum. This is not quite how it works. Ears are extremely sensitive to pressure changes and when you ‘feel’ the compression wave, it is probably by ear. This means that the compression wave travels into the air of the building (glass windows will happily do that). The resonance frequency of the building is supposed to be something like 46/h Hz, where h is the height of the building , although in practice it varies a lot with building design and may also differ whether you hit the short end or wide end of a building. If a building is susceptible to this kind of swaying, it may make people inside feel seasick. Well, I did mention that I am a bit daft. I am curious about the 46/h bit. Is that in feet? meters? smoots? Smots wold be good. But it is just in meters. It is not much more than a rough estimate, by the way. Building design has a lot of influence. Thanks for the nice post Henrik. A week ago or so there was a strange change in tremor measured by slysaalda station. 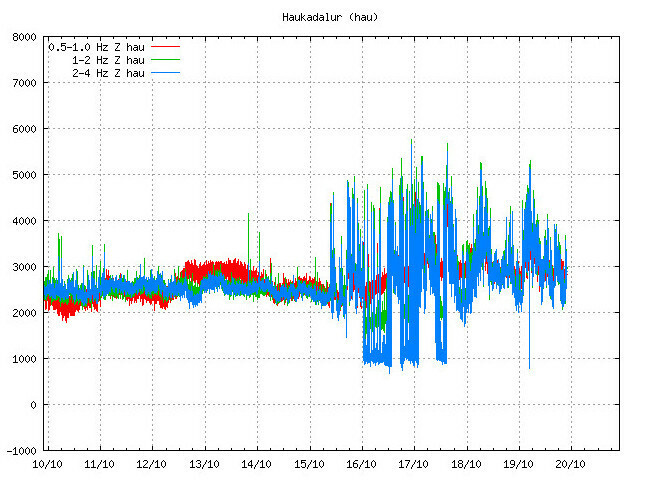 The suddenly, ongoing spiking high hz tremor was registred by several stations nearby too. These seem to quiet down a bit the last days, slowly. 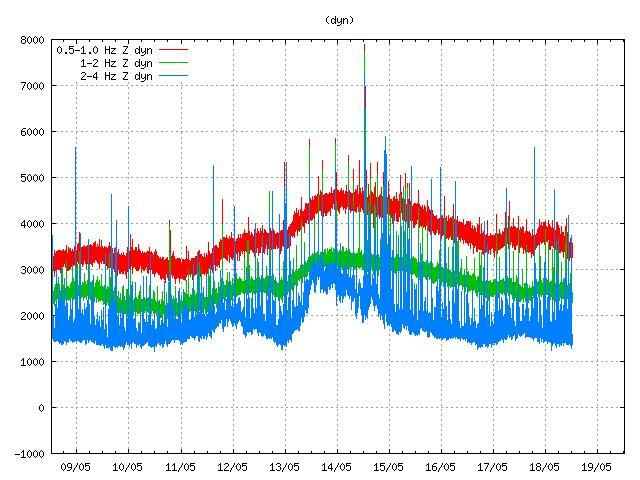 Is it possible that IMO changes the sensitivity of a measuring station, for some reason …? Could it be that they’re doing some regular maintenance rounds? First one station, then another, then another has trucks and technicians moving around practically right on top of it, and manhandling parts of it, before they move on. That might produce such a pattern. P.S. 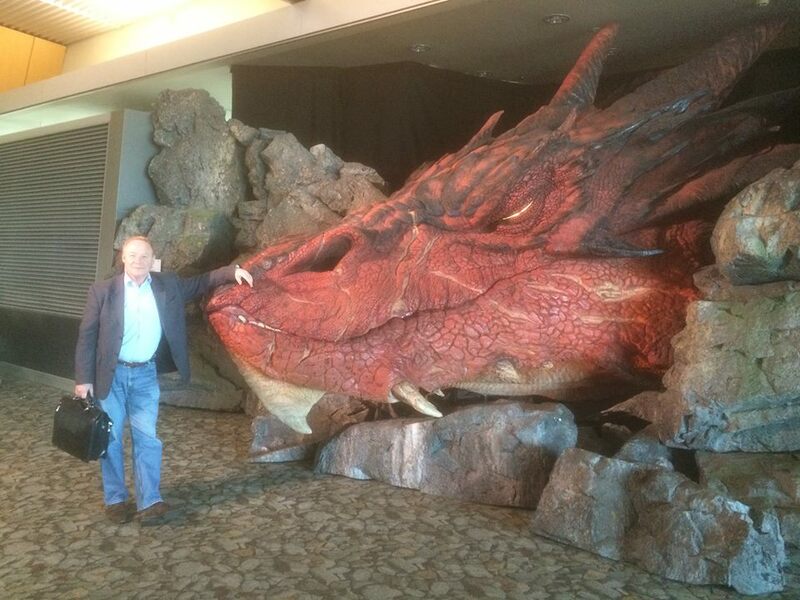 My 5 yr old grandson is really impressed with the picture above of the man standing next to the dragon. The hard part was keeping the dragon still. 😀 Must be one of those intelligent, self disciplined dragons. Mike Ross said it’s from somewhere in New Zealand – which would make sense as they filmed all the Peter Jackson movies there. The Colima region is under threat of a major hurricane which could make landfall over the weekend. I hope very much it will stay out at sea. I think it’s the sun that is making this image so bright. and this at Aso can’t be good..
sorry, not qualified to interpret. good at all for Japan..
Can’t seem to get the Cameras up, either.. The alternative camera seems to be working, mind you its close to 4 am, so only a pair of headlights and a streetlamp are visible. Yeah I just saw the lights on the alternate.. Meanwhile, you are the right age to enjoy this. It ain’t Meanstreets, but musically, it’s pretty near the same song. Its probably what became Meanstreets. Its around 40km from Aso, at 10Hz..good for large magnitude events, but not for volcanic monitoring. I have to admit that I have never come across the unit “kine” before. “Micro” is easier as it means “one millionth” but millionth’s of what? And just how significant is a rise from about 0.00003 to 0.0008 “kine”? 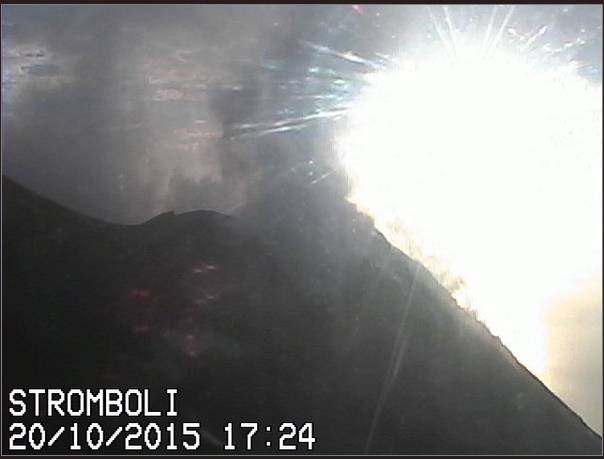 The warning not to approach the volcano has been in place since 14 September so it looks like the arrival of the eruption is imminent, though the car park lights appear as stable as the 4.00am camera can show…. We await whatever the daylight might reveal. Something is on its way – thank you Bill. My imagination or does the car park look like it has a layer of ash on it? Camera seems to show an ashy haze. Maybe it was ramping up for a small ashy ‘pop’? Argh! The web site has eaten my name! Now corrected – it’s me. Has something gone wrong with the site log in? I’m being refused, with my regular WordPress log in…. Oh – now I am suddenly logged in and my previous comments vanished! Weird. Anyway, I was wondering if the web cam for Aso was showing ash on the car park, as well as an ashy haze? Was that the result of the activity? Well it is a lovely sunny day in the car park which is quite full now. 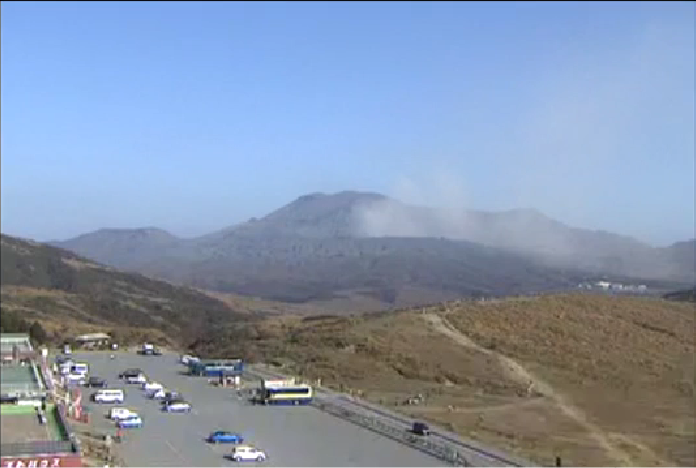 Aso is looking pretty active though not a huge plume as yet, and the coach trips have arrived…. Many thanks, Henrik, for an interesting and informative post that has deepened my knowledge and understanding of the factors that can influence tremor charts, and that has helped me read them a bit more intelligently. I hope their tsunami warning system is up in paradise. Dunno if it’s gonna be needed. There was a large strike-slip component in the beach balls so there may not have been a huge displacement of water. No, it was not pure strike-slip, more of an oblique fault. 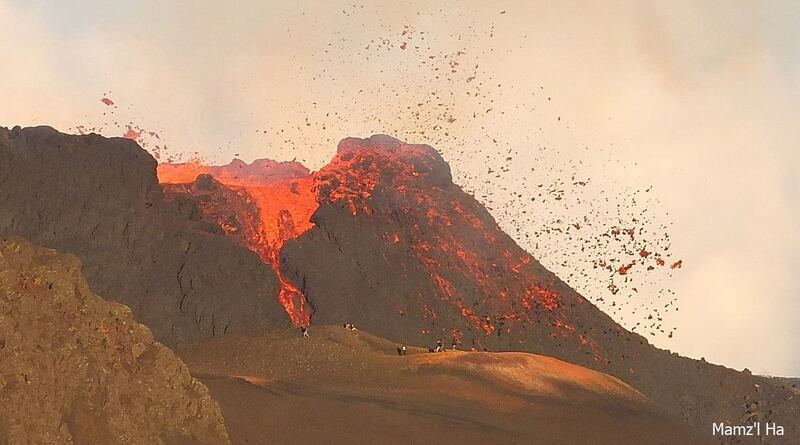 That is only about 50km from the location of the Kuwae eruption, among the largest of the last 2000 years. But big earthquakes are very common in this region. Plates are moving at break-neck speed there. Unfortunately that illustrates my point of view about NOT being in a bad location. One badly located froth in the magma lake or a section of the rim failing and those people are dead, period. No possibility of rescue. Tremor graph is really saturated. I had originally linked a Frank Zappa song here, but since Steve Vai was a member of hit group, and had done a rendition of Paganini’s Caprice #5 in the movie “Crossroads”, I dug up a young girl doing a cover of that instrument/song combination. Interestingly, I think he actually plays “stunt guitar” for Ralph Macchio against himself as another character. The original “shredders” were violinists, and it’s been around much longer than the electric guitar and modern music. Seven minutes later, at 21:15 UT. Large explosion, not an eruption. Great screenshot, I was just coming on to tell you all but you beat me to it Henrik! Checked the link from BillG as well and that was going mad earlier, calmed down a bit now. The hurricane heading for Colima is now being reported as the strongest ever in the Central /North America region. I hope people have been evacuated in time. With winds over 200 mph at landfall, not much will be left standing. Also, this is even stronger than Super Typhoon Haiyan. yes, Patricia is the strongest hurricane in the eastern Pacific, but also very small. At 1200Z eye was only 7nm wide. And it is weakening slight (it’s peaked). The good news is the area where it will make landfall is sparsely populated. It is also forecast to be below hurricane force (64 knots) within 12 hours. It’s probable major effects are going to be to S central and E Texas later next week. Current model runs are for over 1 foot just north and west of Houston. annddd, it looks like made a turn, and is heading directly to Colima! Relative to the pressures that typically drive magmas and eruption, the barometric pressure drop is pretty insignificant. It could set off a volcano by pressure alone. But it would have gone off a fraction later anyway as it would have to be very close to erupting anyway. So it is pretty neglectable. 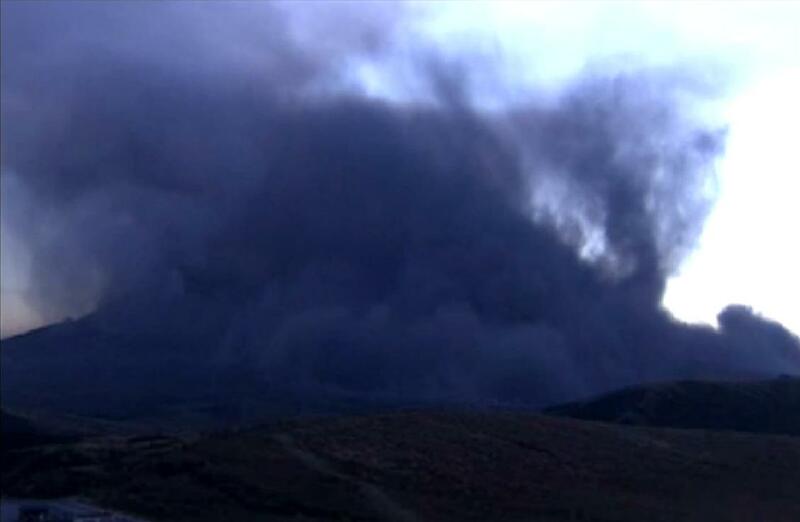 Then again, large quantities of rain and wind can turn into Lahars or blow ash clouds towards unprepared areas. In the worst case scenario it could set off large landslides resulting in a St Helens like scenario. But again, this only plays a role if a volcano is close to or already erupting. 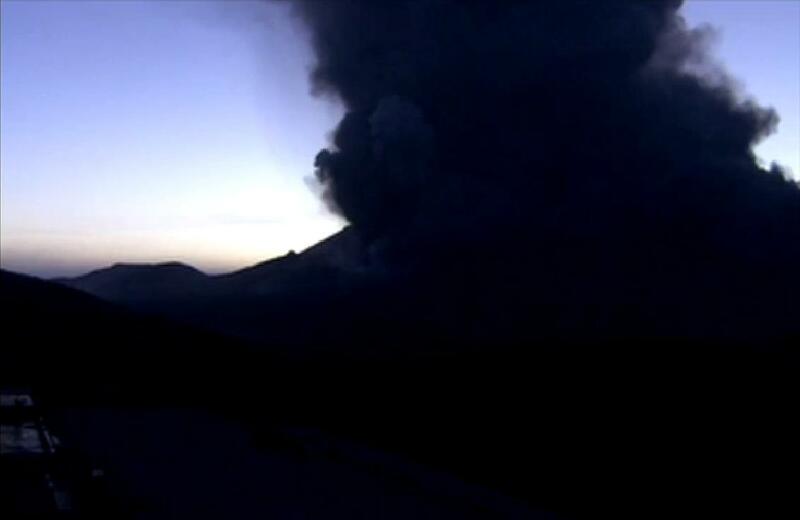 At the very least, its a moment where a volcano is somewhat obscured from proper monitoring. The old cone to the West has a lookout on top- had the habit of buzzing it in the DC-7 tanker when we worked that area..